If I was on the show "Who Wants To Be A Millionaire," and was asked the question "Where does hummus originate from? "...I would without a doubt shout GREECE!! Regis Philbin would give me that face where he hangs his head low and looks at me with great disappointment. WRONG ANSWER. Sad face..and Ian would be mad I just lost out on a million dollars. Ian and I go through a container of hummus about every 3 days. Is this normal? Can you overdose on hummus? Hmmm..
1 roasted red bell pepper. This is not part of the original recipe but I added it to give it a little "kick." 2)Place in a small bowl and garnish with parley leaves. Seriously we have ESP or married to brothers prob both, cuz we go thru hummus like crazy weekly too I actually made it yesterday too! We love it! Traders makes a really good 4 some I always try to replicate! This is one food my kids will literally eat right out of the container. With their fingers. I really need to start making my own. Love that you added roasted red pepper. Oooh, I love the sound of the added roasted pepper Lindsay. I also like to add some peanut butter to mine. Love hummous! 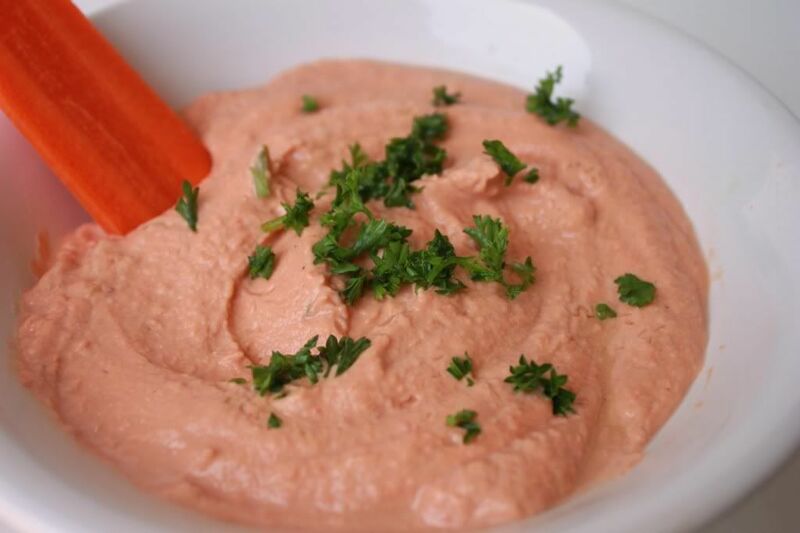 Red pepper hummus is my favorite. I've never made it at home, though...I don't know why. I'll have to try it! Hummus is one of my favorites! I never would've guessed it's from Syria, though - looks like we both would've missed out on the million! I'll have to try this recipe - it sounds so good! I love hummus!! and I wouldve yelled out Greece too. A nice interesting fact to know! I have wanted to make hummus for the longest time. My husband LOOOOVES it. I don't know why, but I'm totally intimidated by my food processor. Mmmmmm, hummus is my friend. My stomach is growling loudly now! It sounds super easy. Im definitely going to try this out over the weekend! Thanks for the recipe. hey i love this blog! you have brilliant kitchen ideas and very easy recipes! anyway, i love your style! browsed through your posts and i love your passion for food. keep it up! PS thank you soooo, so much for putting me on your "Blogs I Read and Love" list - I just noticed that and it made me so happy I can't even tell you!! PS I love your Pinterst! I'm going to follow as soon as I get an account - I'm waiting for my confirmation still! Thanks for swinging by my blog! OMG I can single handedly eat an entire humus container in one setting lol so I think you and the boy are ok! lol " i googled it so it must be true" I say that all the time to my hubs.. "i saw it online!" great recipe... I miss hummus i dont think ive had it in sooo long so one has it in china. maybe i can find all the ingredients in the grocery store here.